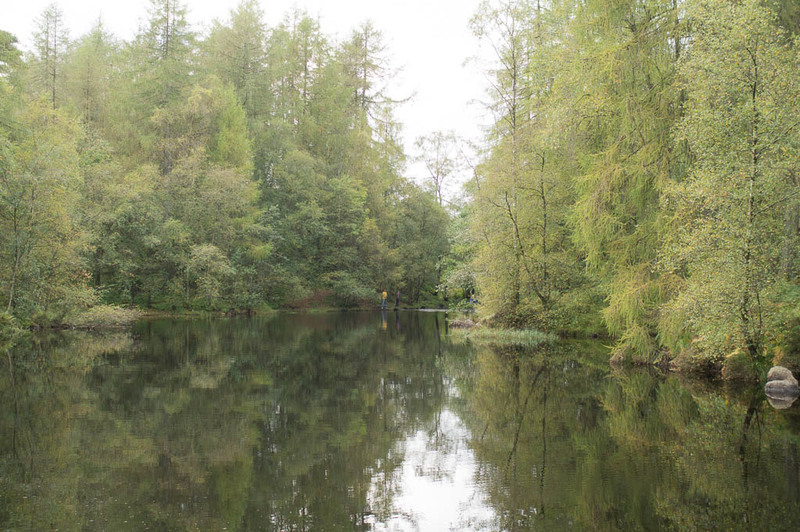 I recently wrote a post about the award-winning Stott Park Bobbin Mill visitor attraction, in which I described just how much I like the atmosphere of the green, leafy areas around Newby Bridge, Lakeside and Finsthwaite, situated on the western shore of Windermere. 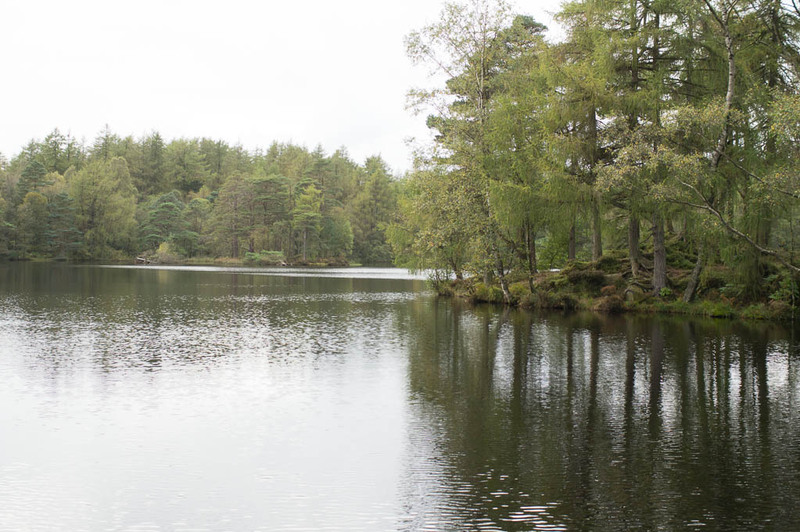 Whether or not you decide to visit Stott Park, there is also a very beautiful walk nearby that I thought worthy of a mention on the blog: the walk to High Dam. 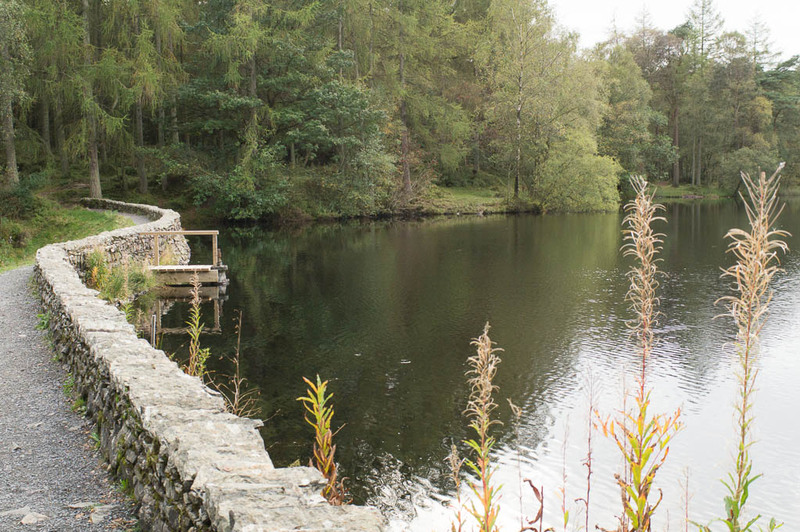 High Dam is an artificial tarn about 1.5km away from Stott Park Bobbin Mill, which was constructed to provide water to power the mill. 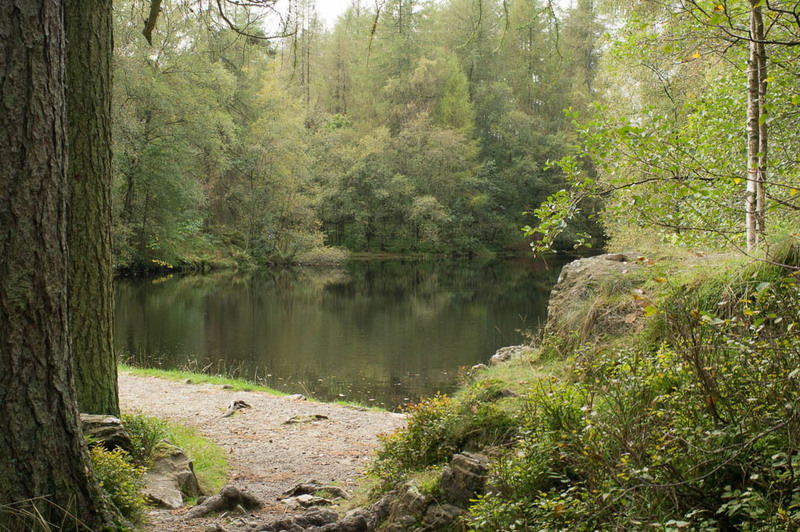 Apparently, no-one knows exactly who built the tarn, which was in place by 1848, and is now a local beauty spot. Surprisingly, very few people seem to have heard of this route either, even though it is clearly popular with many local dog walkers. 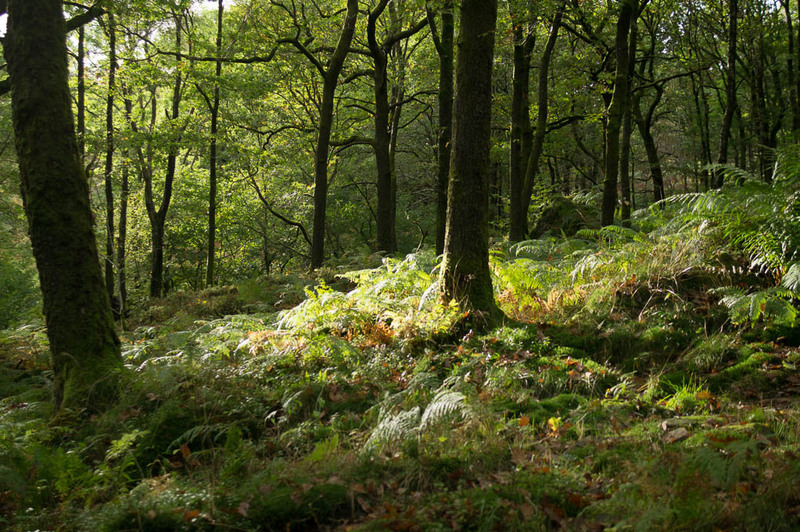 If you are visiting Stott Park Bobbin Mill, this walk is another relaxing way to spend the rest of the day and appreciate the surrounding landscape, without going back to the hustle and bustle of some of the busier areas of the Lake District. You can park at the bobbin mill (a good idea if you’re already visiting, as the car parking charge is currently refunded from your ticket price), or alternatively there is a Lake District National Park Authority car park at the start of the walk itself, just a short distance away. From the LDNPA car park, there is a footpath which marks the beginning of the walk on the left hand side. 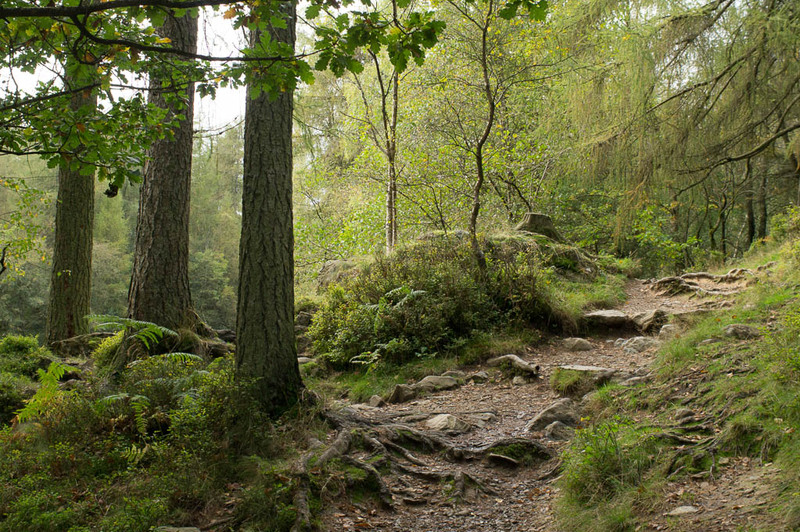 The route takes you through beautiful dense woodland, and first to Low Dam, which is arguably my favourite of the two tarns. On reaching Low Dam, the walk then continues on to High Dam, where you can apparently do a circular walk of this second larger tarn. On the day I visited, there wasn’t the time to walk any further to explore this, so we headed back on the path we had followed up to the tarns. The beauty of walking uphill all the way, is that it is downhill all the way on the return (although I sometimes think I find this the harder part)! 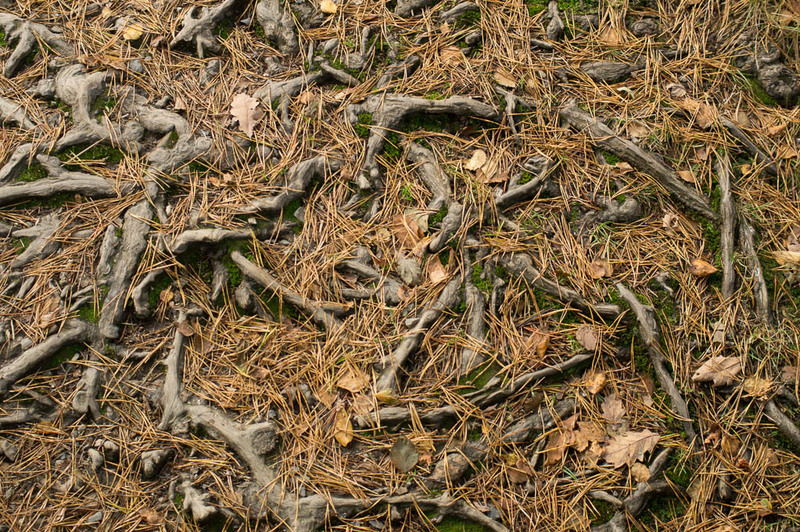 I loved the patterns created by tree roots across so many of the paths, and couldn’t help but stop for a photo. 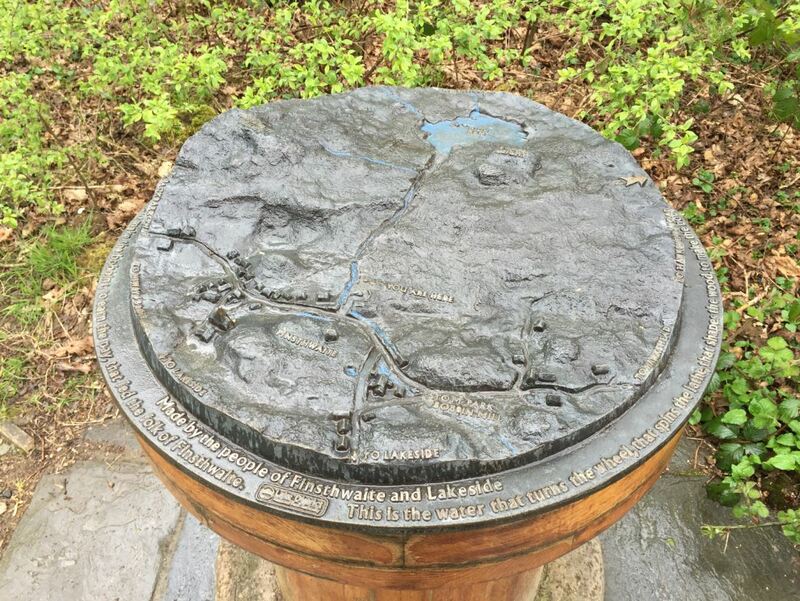 Although – as I’ve pointed out across the blog – I’m not a hill walker, I really enjoyed seeing the tarns and experiencing this area on foot (and I only ever include things on the blog that I would genuinely recommend to others). The walk also comes recommended by Stott Park Bobbin Mill, and I spotted a pack of English Heritage route maps available at the gift shop (£2.50) to guide you. If you are visiting by car, don’t forget to bring suitable footwear and clothing, as I found that some of the paths were quite rocky and slippery in places. Have you taken the walk up to High Dam? Let us know what you thought by leaving a comment below (commenting is really easy, and doesn’t require sign-up). Just spent an hour or so wandering round both High and Low Dam with the dogs. Tranquil beauty is how best to describe this gem. Even at 8pm there were people swimming in the waters with their four legged friends. The low sun made for some great atmospheric pictures and as a bonus, the path around High Dam has been made ‘more user friendly’. Rarely miss an opportunity to spend time here whenever passing, late evening before sunset is my personal favourite as generally you have the place to yourself. The Coniston Fells provide a great backdrop and I believe there are trails that can take you further into the surrounding countryside. Thanks for commenting Ian – it’s great to hear you enjoy this area so much, and I would imagine it is lovely on a sunny evening. I didn’t get chance to walk around High Dam itself, so thank you for recommending the path there too. Did this yesterday morning and, since we have a static caravan at Summerhill, south of Bowness, I think this will become a regular haunt for morning walkies with our rescued lurcher, who thoroughly enjoyed it, especially when a deer ran across in front of us! 3 ladies were swimming in High Dam and it was lovely to hear their voices as they chatted in the water. The happy sound drifted across the water as we circumnavigated the lake in a clockwise direction on a stunning, warm, sunny morning. We stopped at a bench (the only bench) for 5 minutes part way round. It was so quiet and peaceful, not to mention the prolific bird life in the woods on the ascent and descent. As regular visitors to Cumbria, from Cornwall, for 23 years we know many gems away from the tourist trail but few as quiet and beautiful as this. Let’s hope the car park never has a cafe or play area. Thank you for your comment Dawn, and lovely to hear about your walk to High Dam – I was completely transported there once again by your wonderful description and wish I was there right now! Will have to make another visit myself soon, and thank you for your recommendation to others! We go to the lakes a few times every year and like to do a small walk when we get to the lakes ahead of our booked holiday cottage being available to get into late in the afternoon. So as usual I searched OS maps and saw this small walk which I didn’t get overly excited about probably because i had never heard about it. But when we got to a tea room for breakfast on the outskirts of the Lakes a man serving enquired where we were walking and when we told him it was High Dam he described it a possibly the best small walk in the lake district in his opinion. So at this point we became really enthused and keen to get there. What a find! We were amazed at how serene it is and its a perfect starter walk for a weeks holiday. Even the rain did not dampen the effect because it seemed to add to the mystique of the place. Totally amazed that its never appeared in any walking mags or books that I have seen. I noticed that the route can be extended so next time we visit I will make this a longer walk to take other areas as well as both High and Low Dam. Thanks Gary – it’s great to hear you would recommend the walk too. I don’t remember hearing anything about this route before visiting Scott Park Bobbin Mill (although I didn’t know the Finsthwaite area so maybe just didn’t notice) so it is most definitely a hidden gem! I hope you enjoy revisiting to extend the route. Ah, I go even further back. 60 to (nearly) 70 years ago, High And Low Dam, Summerside, in fact all the surrounding area was our playground; mine, my sister’s and my brother’s. Our home was down below in Finsthwaite. Stott Park Bobbin Mill was a working mill in those days; the manager, Mr. Iverson, was our next-door neighbour. High Dam (and Boretree Tarn somewhat further away) were the ‘energy’ source for the mill. I remember being told off one day, because my brother and I had been messing around in the ‘beck’ that fed the mill, building a dam, as kids will do! That had reduced the flow at the mill and caused the machinery to run slow. It must have been a dangerous place to work – we visited the mill once or twice and watched all those unprotected belts, that drove the lathes, whipping round at high speed. Health and Safety were not a high priority in those days! At that time, we had real winters. High Dam would freeze quite often and I’ve still the photos of us skating on the ice – a risky venture, as in places the ice was too thin to support adults. On one occasion, we helped pull someone out, who had gone through the ice, using a sledge at the end of a rope. I guess it was an idyllic childhood! Hello Sam, Thank you very much for sharing your memories of this beautiful place. It does sound idyllic – perhaps with the exception of that rather icy rescue!